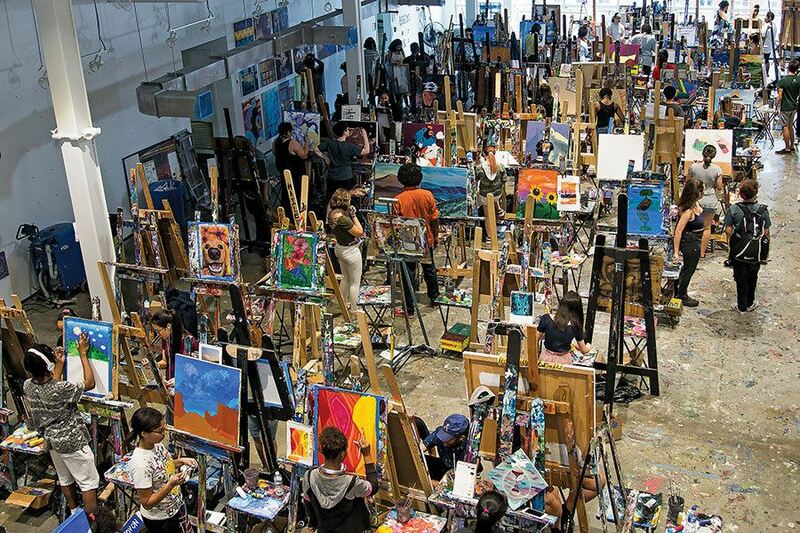 More than 3,000 young people have found employment through Artists for Humanity, a rapidly expanding organization in Boston founded by Susan Rodgerson, who wanted to give youths a path to success. JANUARY 10, 2019 - BOSTON - Sarah Richi carefully adds a line of yellow paint to her newest piece, a 2-by-4-foot abstract painting in a pastel palette. The recent high school graduate steps back on the paint-splattered floor and ponders the whole piece, gently swaying back and forth to the music that fills the studio. Sumeya Ali works on a painting at the nonprofit Artists for Humanity in Boston.Laura Cluthé/The Christian Science MonitorThe piece she is working on is part of a diptych for a client who visited Artists for Humanity and loved her work. The nonprofit organization, now in its 28th year, employs teens from low-income families in South Boston. Between 250 and 300 high-schoolers a year attend AFH summer and after-school programs. Ms. Richi is one of thousands of students who have found purpose, confidence, and employment in the arts in Boston through AFH. The organization aims to bridge economic, social, and racial divides by providing an inclusive atmosphere for youth to grow, collaborate, and create alongside one another while learning to become self-sufficient. Programs that provide paid employment validate that participants “are artists, they have skills, they do have something to offer,” says Miranda Campbell, a creative industries professor at Ryerson University in Toronto. This model provides youths the resources and opportunities to express themselves, find their own voice, and tell their individual stories visually, she adds. Susan Rodgerson, who grew up in the Boston area, founded the program in 1991 with only six teens, at a time when youth violence was rampant and “things were really frightening,” she recalls. Ms. Rodgerson was the first in her family to go to college and went to art school, which she says opened the world for her. Being exposed to the arts enabled her to see beyond her current situation, and she wanted to share her experience with under-resourced youths in Boston. The program provides a safe place to go after school and in the summer, Rodgerson says. Since its launch, more than 3,000 young people have found employment through AFH, and 12,000 more have explored the arts through its partnerships with Boston Public Schools and other institutions. Employed youths work on art projects at Artists for Humanity in Boston. The nonprofit’s studio has reached its maximum capacity, so the organization is in the process of doubling the size of its facilities.Laura Cluthé/The Christian Science MonitorAFH provides creative services such as painting, graphic design, videography, photography, and 3-D design to individuals, businesses, and civic clients. It pays its youth employees an hourly wage of $11 plus a 50 percent commission on the sale of their work. During the school year, AFH offers tutoring, high school credit programs, and college prep help. One-on-one tutoring is required for those whose grades fall below a C-minus, and their employment is put on probation until they can get their grades up. Nearly all the youth employees in AFH are from low-income families in Boston. One hundred percent of participants who stay in the program for more than two years graduate from high school on time. Of those who get accepted to college, 66 percent successfully earn a degree, compared with the national average of 46 percent. “From the very beginning ... we were operating under the idea that if we educated our young people, if we expose them to the possibilities, the careers that were available to them, the educational avenues that were available to them, that they could then go out and become successful and prosperous individuals,” says Jason Talbot, a co-founder of AFH and the special projects director. “The support that the community sector can offer can be really key in helping those transitions and helping young people along in their journeys,” Professor Campbell adds. The Boston Green Academy sends about four to five high school students from each grade level to AFH’s program each year. Kathy Ennis, a college counselor at the academy, has seen the effect that AFH has had on students and the need that art programs like this fulfill in schools that do not have well-developed art departments. AFH allows students to “come and create, and really gain confidence through their artistic ability,” Ms. Ennis says. Art programs like the ones at AFH give students “more motivation and more confidence to move forward with their education.... They’re able to earn money while they’re actually doing something that they love and enjoy, and something that’s going to help them grow and develop,” she says. AFH has grown considerably over the years, moving from a smaller studio space in South Boston to its current 23,500-square-foot location in 2004. It opens up this space for public events in an effort to engage with more of the community. The current studio has reached its maximum capacity and there is a long list of youths waiting to join AFH, so it’s in the process of doubling the size of its facilities. Expanding will enable AFH to employ more youths, offer studio memberships and adult classes, and establish a community gallery with rotating exhibits. Currently, 40 percent of AFH’s budget is earned through sales of projects that youths and mentors do with clients like Converse and the City of Boston. Its remaining budget comes from grants and donations from individuals, foundations, and institutions (54 percent) as well as from government funding (6 percent). AFH is also working on a “STEM to STEAM” curricula development program to encourage the integration of the arts into the study of science, technology, engineering, and math. 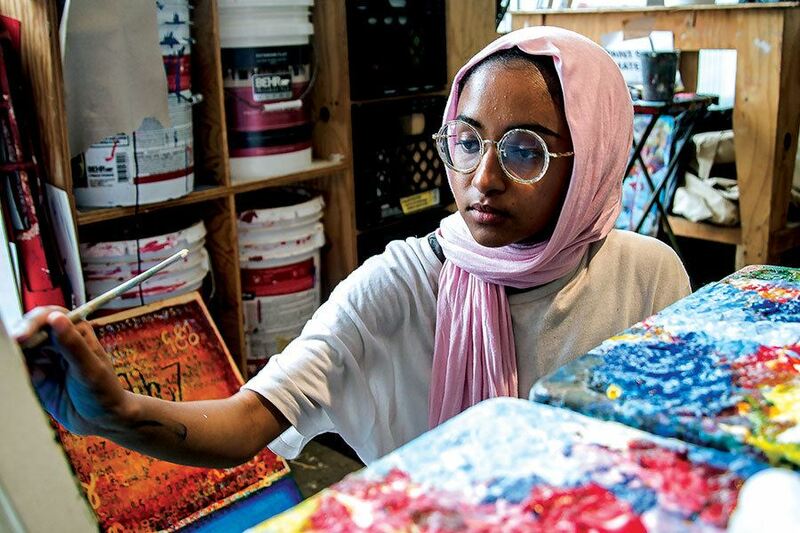 Sumeya Ali, an employed youth at AFH, says a summer job in the arts sets her apart from others, especially as STEM-based education gets more attention and focus. Ms. Ali began studying public health at Simmons University in Boston in the fall, and she hopes to create her own artistic organization that “bridge[s] the world between science and art in an innovative way,” she says. Pairing students with mentors who are also alumni of the program is key to the program’s success. Richi’s mentor is Aristotle Forrester, who was a high school employee at AFH. After building a successful career as a painter, he is currently showing his work in exhibitions alongside iconic artists such as Willem de Kooning and Jackson Pollock, while also teaching the next generation at AFH “how to participate in the art world” and be “art monsters,” he says. • For more, visit afhboston.org.